Riad Amirat Al Jamal Client Comments, Reviews and Testimonials. 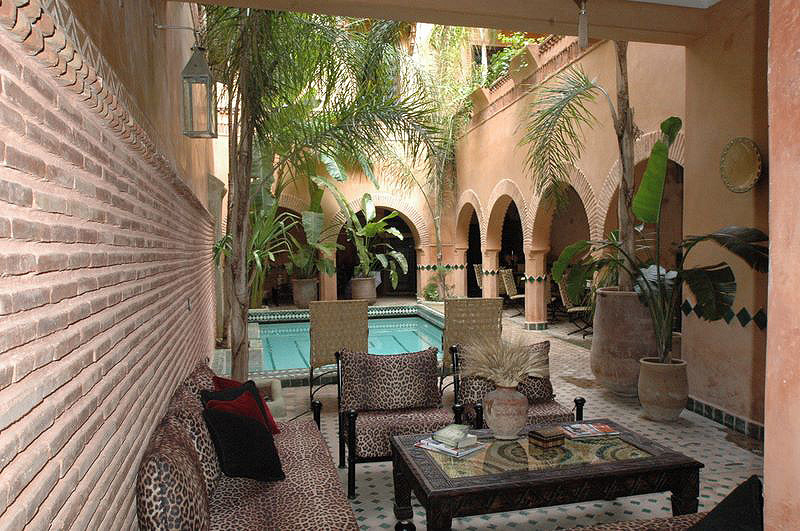 Book Riad Amirat Al Jamal Today with Hip Morocco - Holiday Accommodation in Marrakech, Morocco. 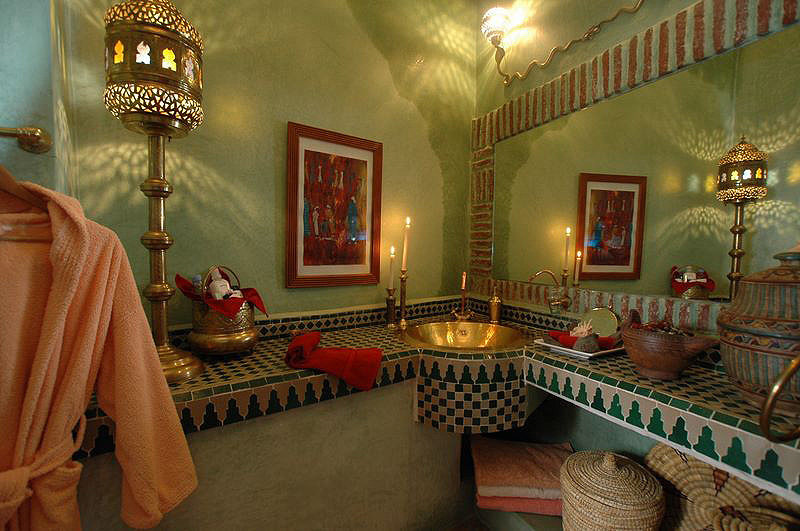 "Offers both traditional Moroccan decor and hospitality and American style amenities." 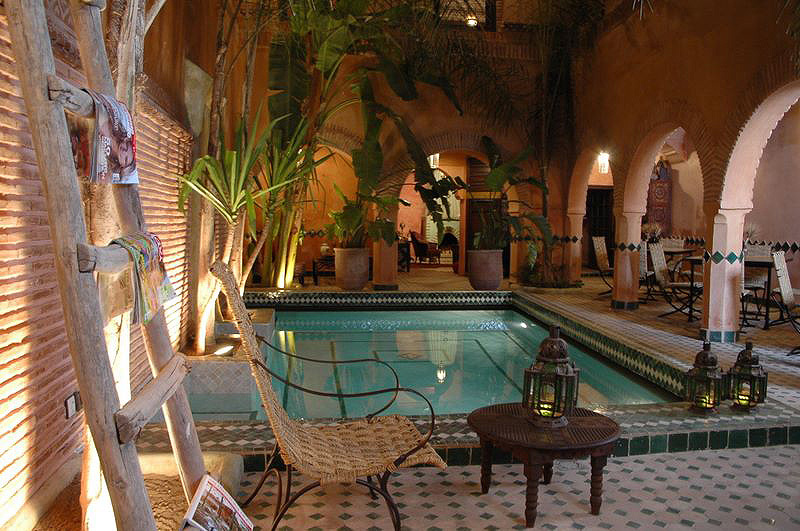 Riad Amirat al Jamal is located in the palace district of the Marrakech medina (old town), just 2 minutes from both the historic Koutoubia Mosque and the most famous public square in Morocco, Place Jemaa el Fna. The activities nearby are boundless: shop in the colourful souks, eat in Marrakech's best restaurants, or explore the picturesque Marrakech ramparts. 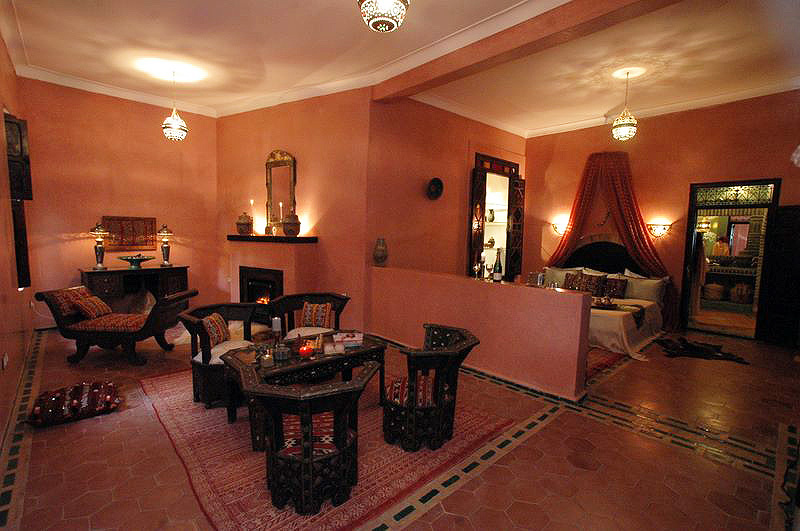 Owned by an American, the riad offers both traditional Moroccan decor and hospitality and American style amenities. For the peace and relaxation of our guests we do not accept children under 10 years of age. 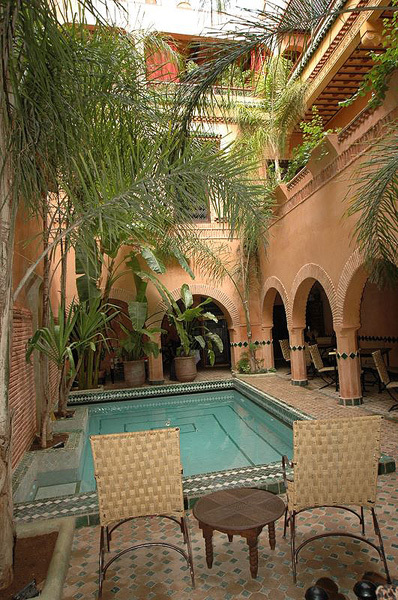 Riad Amirat al Jamal is located in the palace district of the Marrakech medina (old town), just 2 minutes from both the historic Koutoubia Mosque and the most famous public square in Morocco, Place Jemaa el Fna. A quiet standard double room overlooking the swimming pool. 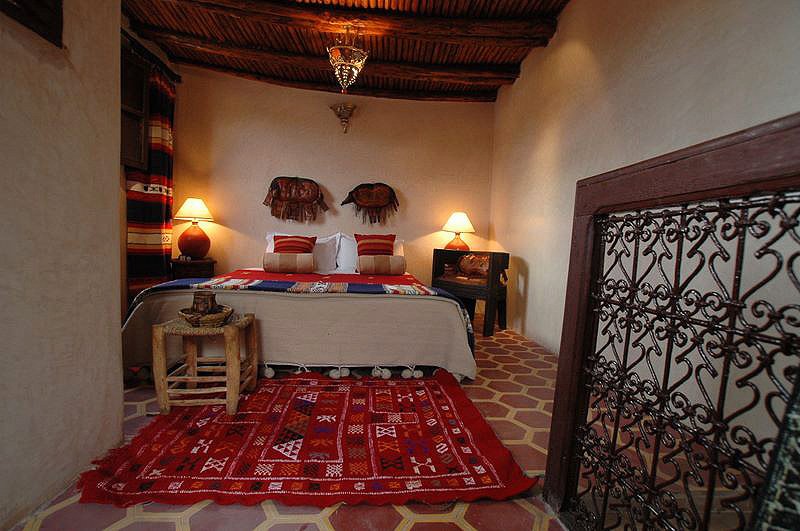 Featuring a king-sized bed, with traditional Moroccan decor in coral, yellow, and red tones with blue accents. The closet is crafted of wood, using a distinctive Moroccan grillwork. A deluxe room with a large bathroom, refrigerated minibar, an "Ikki" oleander wood and beam ceiling, and a restful covered outside terrace with sofas and chairs. Sleeps three persons with a double bed upstairs and a single downstairs. 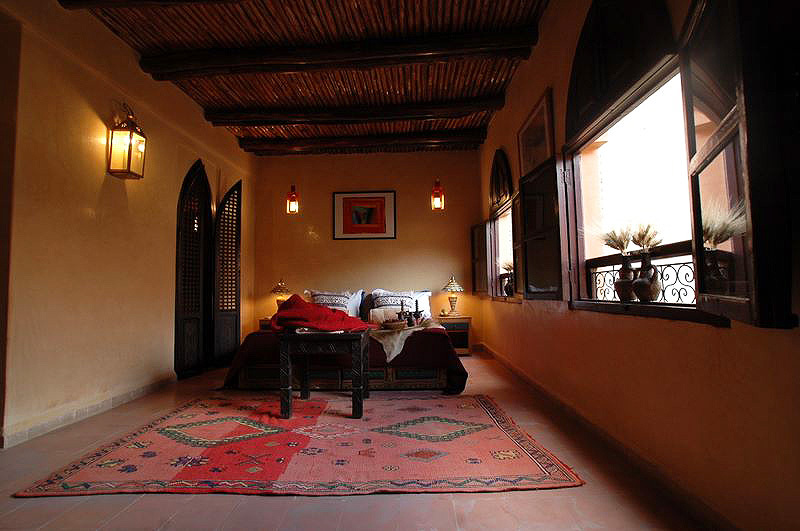 The views from the five upstairs windows overlook the lovely Koutoubia Minaret and the High Atlas Mountains. It also has a minibar and its own inviting private patio. A sunny standard double room with an "Ikki" oleander wood and beam ceiling and a colorful creme and red decor, a cozy alcove with a small fireplace, and two windows with views overlooking the swimming pool and central courtyard. 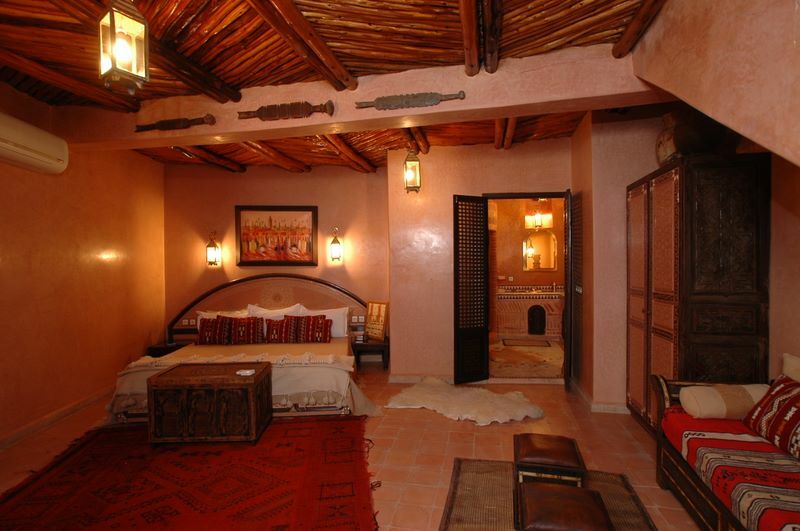 Large sumptuous suite in traditional peach tadelakt. 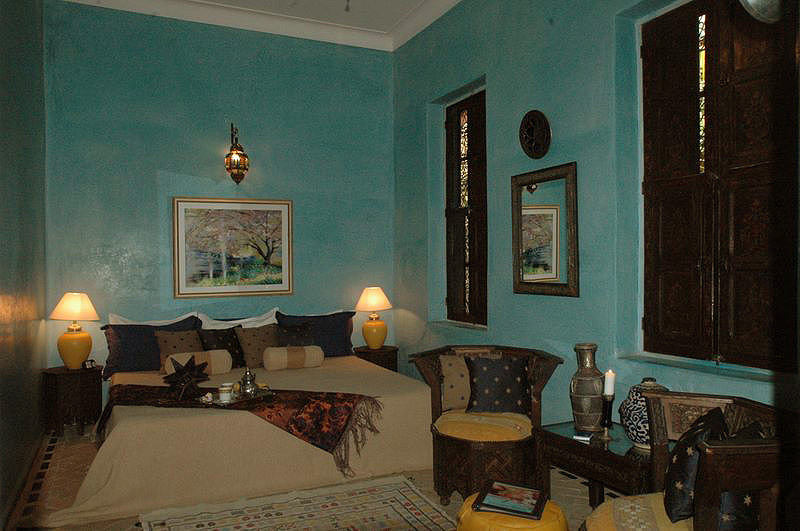 Fine Berber rugs, handmade mirrors and furniture and minibar with large ensuite bathroom. 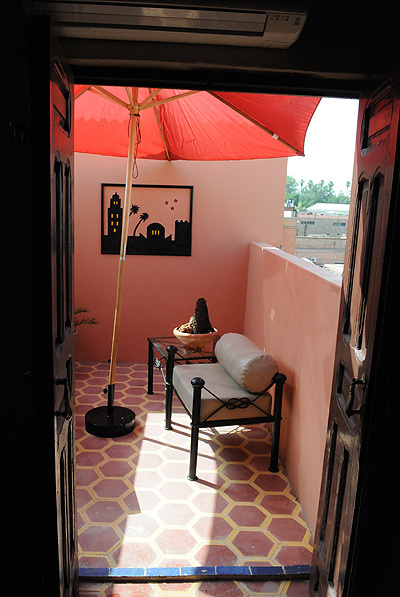 Situated on first terrace level, receiving early morning sun and the song of native finches! This room can sleep three adults if required (supplement). 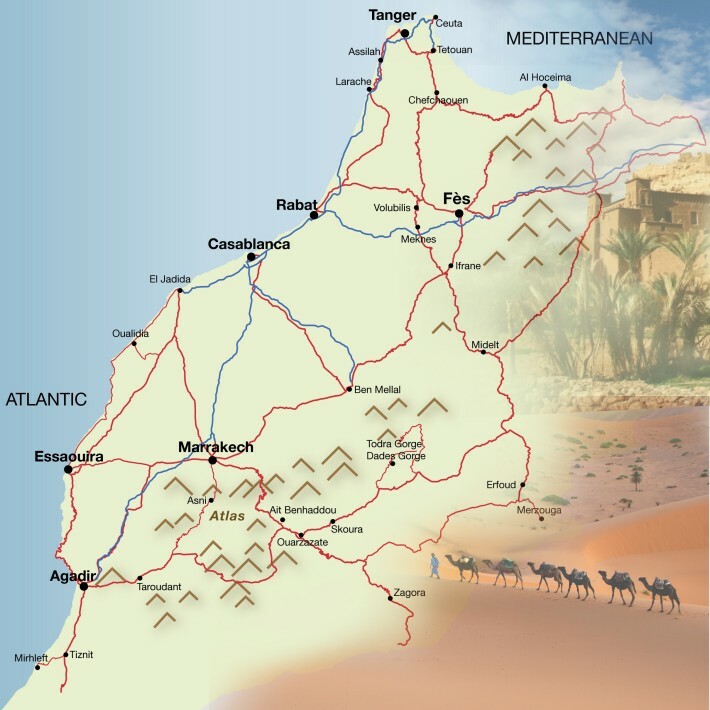 The base rate price at Riad Amirat Al Jamal is in pounds, euros, or Moroccan dirhams and exchange rates are approximate.